I had a layover in Memphis last night and hopped onto the shuttle in the morning heading South. It was a 90-miles trip crossing the state line of Tennessee into Mississippi. Strangely, we had a lot of cops waving their speed radar that day and we ended up reaching Tupelo in 2 hours rather than the usual 1½ hours. Any longer, and I would just have to pee in the car liao.... big difference what an miscalculation of 30 minutes can mean! To save a couple of bucks, it was decided to have instant noodles, that I've brought, for breakfast instead of going downstairs for the all american breakfast buffet, which there is no way I can ever eat enough to justify my money's worth. 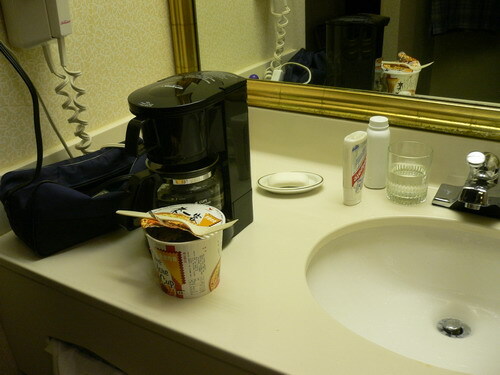 I had to use the in-room coffee maker to boil the water but the strange thing about these coffee makers is that the taste of the coffee from the previous brew will always be there no matter how thoroughly you washed it. Coffee-taste instant noodles anyone? Good thing I brought a fork along or I may have to eat my noodles with my toothbrush again. Right, Chris? When I stepped into the market, it was machiam a ghost town. Where everybody go? As I had expected, the market in Las Vegas, two weeks ago, had severely affected this market. 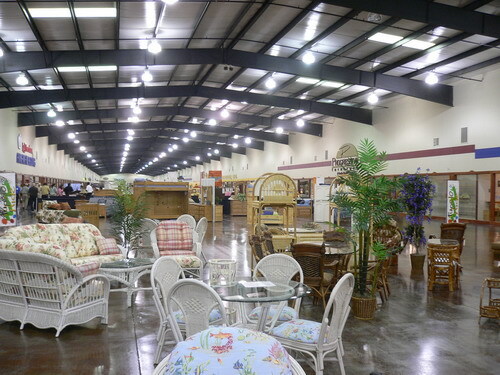 The Las Vegas market was a new market, which made its maiden debut just 2 weeks ago. Obviously, with Vegas itself being a natural draw, all the visitors flocked to Las Vegas at the expense of this Tupelo one. It was quiet everywhere even though today was supposed to be the official opening day. Folks are worried about covering their rent (about USD 4 per sq ft) even though it was significantly cheaper than the Las Vegas market (USD 38 per sq ft). The last time I saw such a pathetic turnout was the High Point market in October right after the 9-11 incident. That was one market where the salesmen outnumbered the customers. Real sad and sorry sight then. Good luck to the people of Tupelo! The way I see it, with Las Vegas market here to stay permanently, I think this Tupelo market is as good as dead and buried. I, for one, will not be returning again unless for some miracle turnaround which I think is highly unlikely. I kind of worried about the local folks in the event of the demise of the market. Lots of jobs will be laid off, loads of service stuff, nearby restaurants and hotels, etc. will suffer too. akk: This is just one of 6 halls at the market. Imagine 6 empty halls. Damn sad story. *sigh* i miss my 'hong-shao niu rou' Kang-si-fu instant noodles! Kang Si Fu was the only luxury i had during my sojourn at a god-forsaken port in guangxi, china during '95-'98. Anyway, glad to know that you are back home liao. Yes? i was an employee then. quitted in '98 and came back to spore. I am sure the experience there would have served you well today.